Many tourists arrive in Leknes by air, and Lofotekspressen connects to all arrivals. If you want to take a look around town before travelling onwards, there are many charming stores and eateries to suit every taste. Once you’re ready to move on, hop onto bus 18-741 and set a course for the Viking Museum at Borg. 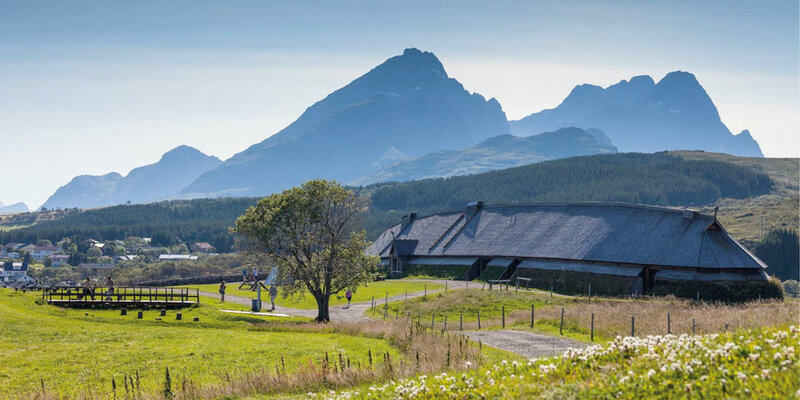 The Lofotr Viking Museum is situated in spectacular landscape and is home to Europe’s biggest Viking-era house. It is a living, interactive museum, where you can eat Viking food, try rowing a Viking ship or become an expert in axe throwing. Allow plenty of time for the museum. Route 18-741 will also take you to the medieval town of Kabelvåg. This is home to the Lofoten Cathedral, one of Norway’s largest wooden churches, which was built for fishermen working during the Lofoten fishing season. The town of Kabelvåg has kept much of its older architecture, and they continue to hold big markets just as in the past. It is also home to the Lofoten Aquarium, which shows what lives in the sea beyond Lofoten. Finish your journey in Svolvær and head for one of the town’s many pubs or outdoor spots. If you spend the night in Svolvær, we recommend a boat trip to the magical troll fjord. There is an airport in Svolvær, so this can also be a natural starting and stopping point for your trip. Recommended stops: Leknes, Borg, Kabelvåg and Svolvær. Read more about the Lofotr Viking Museum here.